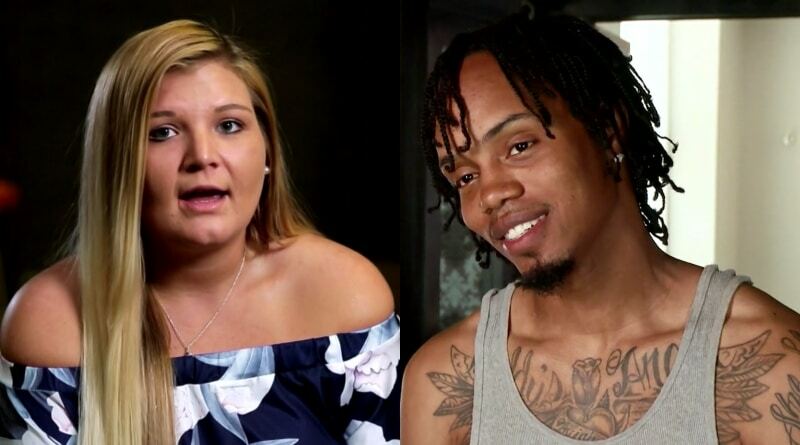 Love After Lockup‘s Sarah says she’s pregnant (again) with Michael‘s child. WE TV watchers see on the show that Michael seems to want nothing to do with Sarah on a long-term basis. He only wants access to their daughter. Plus, he’s worried she might say bad things to his parole officer. Meanwhile, Sarah is of the mind that the three of them will be one happy family. Now, it looks like Sarah is going to add to that number with another of Michael’s children. On the last episode of LAL, he claimed she “seduced” him in the shower. Even so, she was reportedly already preggo. Both Sarah and Megan are radio silent when it comes to their current relationship with felon Michael. Some viewers suspect they’re all staying mum while the season currently airs. That said, Sarah recently took to Twitter to confirm that she is pregnant with her second child. In addition, she confirmed that Michael is the father. She also claims the pregnancy wasn’t planned. Even though the Love After Lockup mom of one says she didn’t intend to get pregnant, some fans have other ideas. Perhaps Sarah got pregnant again to try to lock Michael down. On LAL, Sarah wants them all to be together as a family. So, was she hoping that another baby would keep him with her – or keep him from violating parole and going back to prison? Or was it just a woopsy? Michael talks about wanting to leave Sarah all throughout the current season of Love After Lockup. He calls Megan “my queen”. But it all is a moot point as Michael was once again arrested in December for drug possession. Many LAL fans wonder at the timeline of Sarah’s pregnancy. They’ve gone so far as to call her out on social media. She fired back at haters a number of times as a result. Interestingly, while she revealed some information about her pregnancy on Twitter, she wasn’t always so forthcoming about it. Replying to one Love After Lockup follower, Sarah said that she didn’t want to speak publicly about her due date and the gender of the baby. She is also in hot water for another snap. The picture in question shows Sarah with Michael. 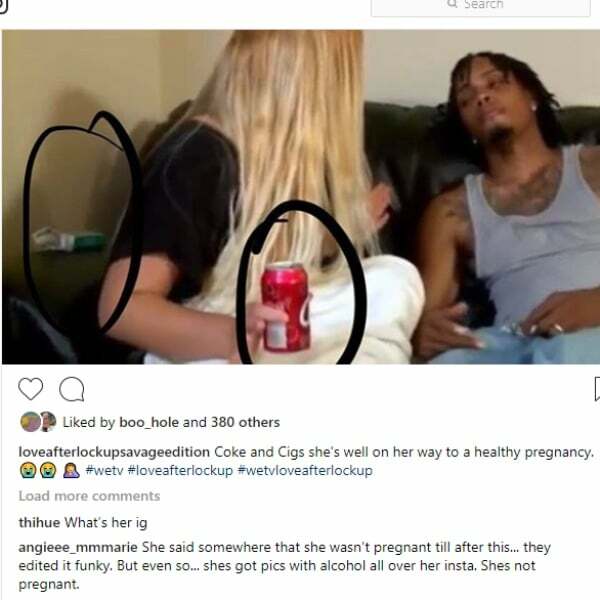 Users have a bone to pick over the fact that there’s a can of soda in her hand and a pack of cigarettes nearby. Love After Lockup showed Michael got out of prison then hopped in a hotel bed with Sarah. Then she drove him to his mom’s, then it seemed he met and deflowered Megan not too long after. But there’s more to it according to Sarah. She says she was seven weeks pregnant when she found out. So clearly the editing was misleading or Sarah is lying. Michael and Sarah’s status is unclear at the moment, especially with the pending drug charges. That said, her recent post on Twitter could hint at the current state of their relationship. She said “YES I’m capable of raising two children period”. Certainly, that seems like she’s planning to raise her two children without Michael in the picture. She doesn’t mention Michael directly in the post other than to say he is the father of the child. There’s no mention of what role he will have in the child’s life – if any. So stay tuned to see what happens next when the women finally face over their ex-convict in common. Watch new episodes of LAL Fridays at 9:00 pm only on WE TV. Visit Soap Dirt often for the latest Love After Lockup news and leaks. ← ‘Sister Wives’: Kody Brown’s Wife Robyn Mentions Cat Fights – Ears Perk Up? 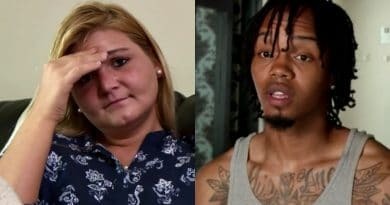 ‘Love After Lockup’ Spoilers: Tracie Has a Son – Does Clint Know?